I cadged the idea for this post, and tomorrow's (Dim Sum - Low), from a shelter magazine I subscribe to. An occasional feature is "High and Low", and it consists of photos of two seemingly identically-decorated rooms, side-by-side. The catch is that one's been furnished to the tune of, oh, I don't know, U$ 25,000 or so, while the other's been done up "on the cheap" for maybe a little less than $5,000. Same-same, right? No way -- close inspection reveals that you can always tell the difference between expensive and cheap chic. What I've found here in KL is that when it comes to dim sum, the line between expensive and cheap is not so clearly drawn, at least not when it comes to the customer's satisfaction. Oh sure, the trappings are as different as night and day -- a grand hotel dining room versus a plastic table on the street. And the ogle factor of higher end dim sum is exponentially greater than that of the streetside version; restaurant dim sum is usually just so pretty. But in the end, I found, whether you prefer high or low depends as much on the mood in you're in and the experience you're looking for as the appearance and taste of the food. Sometimes, rustic is better than refined. We'll start with high, though that may be a bit of a misnomer for the Concorde Hotel's Xin. The Concorde is not a 5 or 6-star hotel and the decor of Xin speaks to that effect; the restaurant has neither the silk-brocaded serenity and leafy view of the Shangri-la's Chinese restaurant, nor the aggresively kinda-old-Shanghai/kinda-classic-Beijing-Mandarin opulence of Chynna, at the Hilton. Xin is more your generic upper-level Chinese restaurant: lots of big round tables, white table cloths and napkins, staff dressed in nod-to-old-China black and white uniforms (frog buttons on the shirts), and too-bright lighting that is not particularly flattering to either diners or photos. But -- a random survey of about 50 locals (OK, not exactly random; all are acquainted with Dave and/or I in one way or another) reveals that the best dim sum in KL is to be had here, so this is where we are. It's fairly swanky, it's not on the street, so in my book it qualifies as "high". I really have no beef with Xin; almost all the dim sum is really lovely. The place draws steady crowds for a reason. 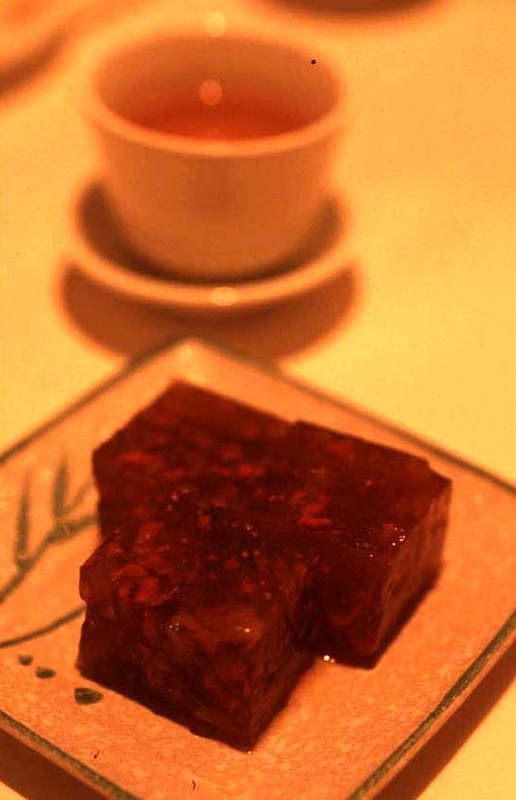 A must-eat is the stir-fried carrot cake. It's made to order at the front of the restaurant, and it's quite delicious. For those unfamiliar with this dish (which I was till I sampled it in KL), it's radish (or turnip? jicama? input please) cakes cut into cubes and stir-fried with eggs, bean sprouts, and green onion, among other things. Every order I've ever eaten at Xin has been perfect: lots of char on the "carrot" cake and eggs, bean sprouts retaining a bit of crunch, not too soggy from too much soy. It's greasy, but that's really unavoidable when one is stir-frying a naturally oil-absorbing foodstuff like carrot cake. It must be eaten as soon as it arrives at the table, while it's still piping hot; sitting does not flatter this dish. Xin, in my opinion, excels at steamed dim sum, especially those involving seafood. Chee cheong fun (rice dough rolls, usually filled and served doused in soy) with scallops is heavenly, and the shrimp enclosed in rice flour dumplings are perfectly cooked to a wee bit "al dente" -- no mushy shellfish here. The item pictured above, pork dumplings topped with shrimp, featured a well-steamed but chewy wrapper and plenty of porky goodness that nonetheless managed not to overwhelm the seafood flavor. Another Xin triumph here: taro puffs. I avoid deep-fried dim sum as a rule; why choose heavy greasiness when you can have steamed, light loveliness? 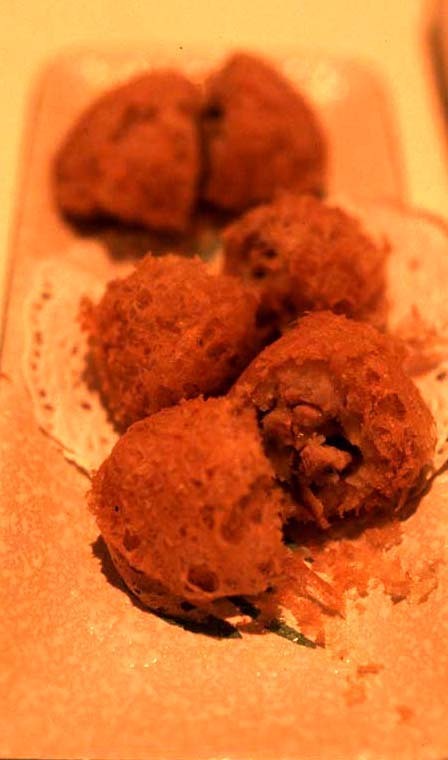 But I make an exception to my rule every single visit for these mashed taro orbs, studded with little nubs of pork, encased in an amazingly dry, crunchy, almost fluffy fried coating. How do they do it? This is comfort food a la mashed potatoes. They're even better if you can snag a just-fried, still-steaming trio. We couldn't get a decent photo of Xin's wonderful congee with century egg and fish; blame it on the near impossibility of shooting white food in a white bowl under poor lighting. But I'll settle for this shot of pork, rice, and salt-preserved fish, steamed in bamboo. It's scooped from the bamboo onto a plate to order. Some of the rice remains untouched by pork goo, providing a little bit of firmness to contrast with the grains softened by pork fat. The pork, which is actually a bit pinkish, is falling-apart tender and speaks deeply of the pig. ; salted fish adds, er, saltiness. It's always a struggle to limit myself to just one spoonful of this dish. In many cases, dim sum desserts are a disappointment, but Xin's got a nice little selection of something sweet to end the meal. These nut, date, wolfberry and whatnot "jelly" squares were new to me. They're densely packed with chewy and crunchy bits but the cool jelly-with-a-whiff of spice (cardamom?) makes them light and refreshing. It's not only Xin's decor that makes the "high" designation a bit of a misnomer. We've never spent more than U$12-14 per person on a dim sum brunch there. And believe me -- we don't go light. I'm talking a dim sum brunch that negates the necessity of dinner. I suppose we should be checking out the other "high" options for dim sum in town. But it's hard to tear myself away from Xin. Xin at the Concord Hotel, Jalan Sultan Ismail, Golden Triangle. Reservations recommended (but none taken on Sunday). I am chuffed that EatingAsia has been given a wee bit of local blog "press" on blogsmalaysia, a round-up of -- guess -- Malaysian blogs. 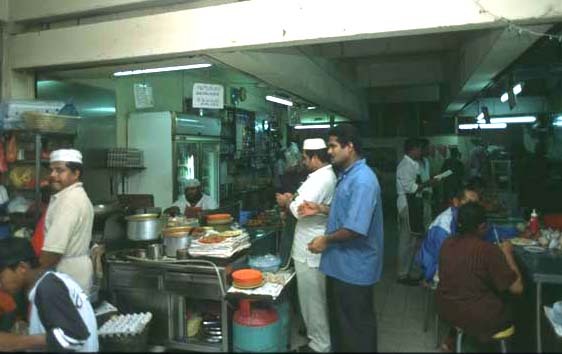 My excitement at having landed in the culinary paradise that is Kuala Lumpur was the impetus for starting EatingAsia. We (Dave and I) wanted to share with anyone and everyone with a little time to waste on the net the breadth and depth of the gastronomic scene in this city, and in the region (at least what we've eaten of it). 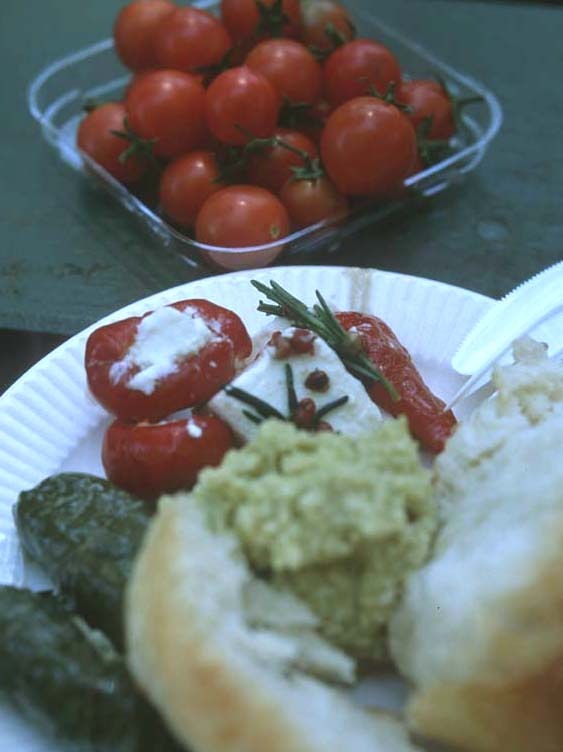 We certainly had no expectation that folks who've lived all (or much) of their lives here would find interest in my babble about -- and Dave's images of -- the edible delights that are merely everyday food to them. Whether we're covering food in KL, or Saigon, or Bangkok, when a local finds what we have to say and show worth a read, well ... that's one of the highest compliments, I think. A bonus for me is an intro to blogsmalaysia, which offers a little insight into all sorts of aspects of Malaysian life. A quick visit turned up links to everything from a serious rant about famous bloggers hogging blog fame (wouldn't know about that) to a heartfelt narrative about an interfamilial clash of religious cultures sparked by a loved grandmother's passing. Interesting stuff -- blogsmalaysia is a must-visit for anyone whose curiosity about this country extends beyond food. Dave and I first stumbled across this storefront in KL's "Little India" a little over two years ago, at the tailend of our first gluttonous visit to the city. With a few hours left before our flight back to Saigon, we'd already eaten two breakfasts -- nasi lemak (coconut rice with various dishes) and a plateful of Indian milk sweets -- and weren't in the market for a third. But when we stopped in front of this shop, mesmerized by the rounds of dough being flipped in the air and then slammed flat on the stainless steel countertop, we received such a warm welcome that we let ourselves be led inside. After plates of flaky roti accompanied by spicy curry and cups of chai (burp), we rolled back to our hotel, caught a cab, and just made our flight, not at all happy to be leaving what we were pretty sure was Asia's prime chow city. A couple of Saturdays ago we decided take a trip down memory lane and track the shop down. After a few minutes of despair -- the neighborhood is falling, bit by bit, to bulldozers and redevelopment -- we thankfully found our little roti heaven intact. 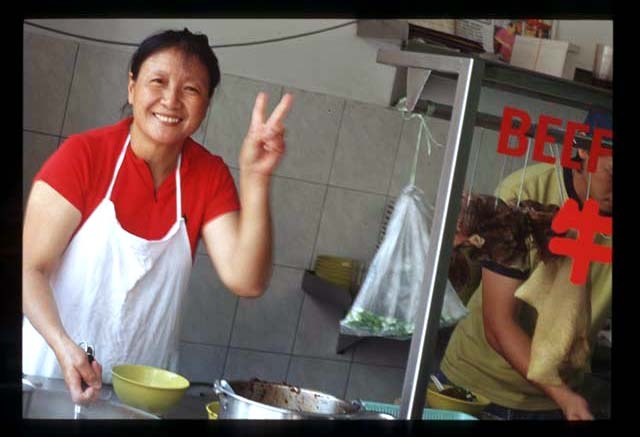 Same roti master (a hulking, but friendly, Jabba the Hut-like character with forearms as thick as small tree trunks), same shop -- with the addition of a lady frying up mee goreng (fried noodles) and nasi goreng (fried rice) in a huge wok at the front -- same warm welcome. We started with a couple of plain roti, and were underwhelmed. Although nearly grease-free, they weren't hot and crisp, as we'd remembered (accompanying thin curry, however, was delicious). Then it occurred to us -- duh! -- that roti is usually a breakfast food; we were eating that morning's leftovers. 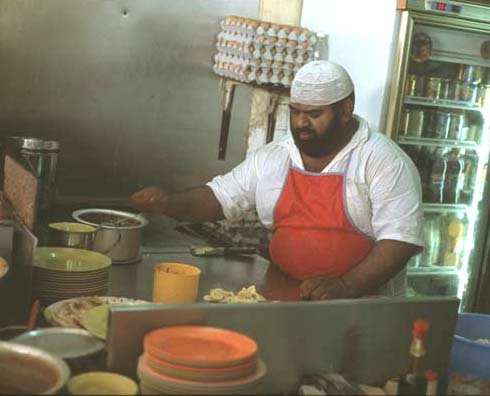 By ordering stuffed versions we could get Jabba moving (he was sitting behind the counter, peeling onions with great concentration) and watch the show, and enjoy our roti fresh off the griddle. Our choice: one banana and one sardine. The latter arrived first. With the first bite all memories of the cold, deflated roti that had preceded it vanished. Now, I suspect this roti might not be up everyone's alley. I happen to be a fan of sardines in any form, including those that come out of a can. Admittedly, they tend to be on the "fragrant" side, but I wouldn't have it any other way. Here we have flaky yet supple (and yes, a bit greasy, but in a positive sense) pastry wrapped around toothsome pieces of fragrant canned fish meat. Note the heavy char on the pastry, lending some crispness and smoky depth of flavor (but not a burned taste). 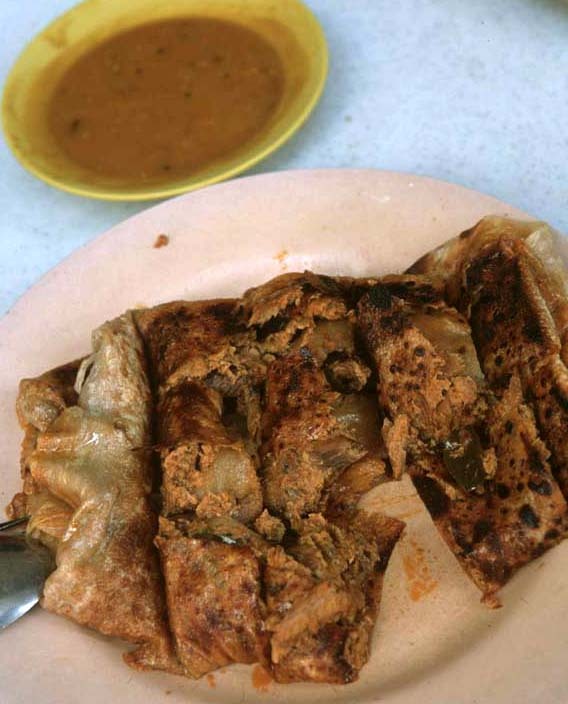 Accompanied by the same thin, lightly spicy curry as our plain version, this roti made us very happy indeed, and took just a few bites to finish. 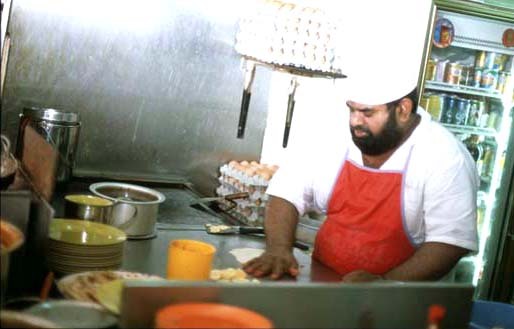 After which we turned our attention to Jabba, already busy whipping up our "dessert" roti. After slicing a banana, he dips his hand into a container of oil and greases his work area. and then further flattens and enlarges it by repeatedly raising it and then pounding it on the prep counter. The result is a paper-thin yet surprisingly elastic dough -- the secret to a flaky yet chewy roti. 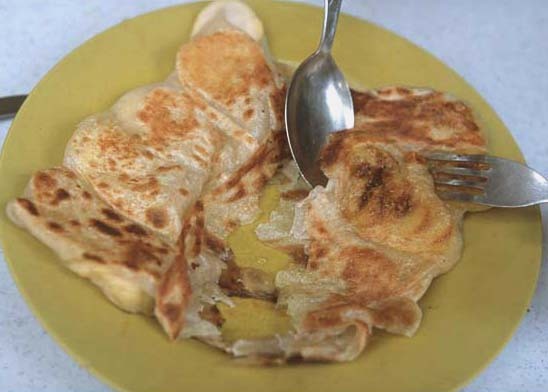 Banana roti (a.k.a. banana "pancakes") are ubiquitous in Thai night markets -- especially so in resort areas -- but I've always been repelled by their excessive oiliness (from lots of margarine) and sweetness (from sweetened condensed milk). This banana roti, by contrast, was sweetened by nothing more than the caramelization of the fruit's natural sugars, making it sweet but not cloyingly so. Like the other roti we sampled it, too, was accompanied by a saucer of thin curry. By now, probably because of our sheer staying power, we rated highly enough with Jabba and his colleagues to deserve chunks of potato and carrotsin our curry. In addition fried rice and noodles and the roti we sampled, this shop also offers egg (telor), onion (bawang), and margerine (majerin) roti. 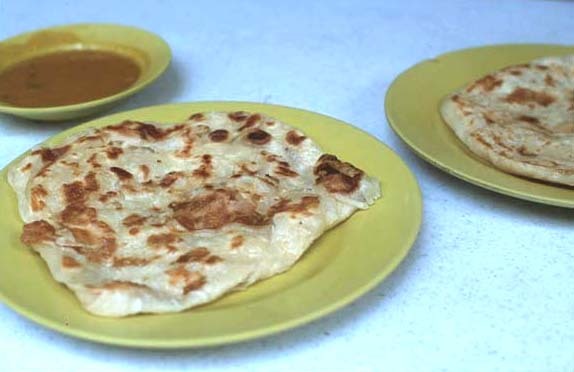 No-name roti shop, one street over from Jalan Masjid India, about a half a block down from Jalan Melayu. Sandwiched between Mohammed Yousuff Frames and Danitex Trading Co. (Walking distance to LRT Jalan Masjid Jamek station.) Open 5am-8pm. Closed Sunday. ...please, for the love of heaven please send me an email. Response to the Eat Some Asia offer has been so slow (though total hits are rising ... huh?) that I'm changing the winning number to 50. How sad is that? duck liver pate at Sean's Panorama. Had one bird liver you've had 'em all, right? No no and three times no. Imagine the deepest, darkest, richest chocolate ice cream you've ever had. Imagine it's spooned from the tub with a long, heavy ice cream scoop and lands on a plate in a thick, wide, ribbon. Now imagine it's liver. Liver pate -- the richest, smoothest, light-but-not-fluffy liver pate you have ever in your life eaten. And it's served with delectable sweet and sour onions en agrodolce and "pulled sourdough" which is -- get this -- sourdough bread that's been literally pulled from the inside of a big, fat loaf, resulting in unevenly-shaped, jagged-edged pieces of bread pockmarked with cracks and crevasses, all the better to catch dribs and drabs of the extra fine olive oil that's been dribbled on top. This dish was not a dream, but I'm still pinching myself whenever I think of it. smoked butterfish at Yoshii. This sleek little Japanese spot near Circular Quay is supposedly where Sydney chefs go when they want knockout sushi. Yes the sushi is good, but Yoshii is, seemingly, an artist in the kitchen and this place is about so much more than raw fish. A perfect fillet of butterfish, graced with a single, highly fragrant mushroom of one variety or another, is sandwiched between two paper-thin slices of Japanese kigu wood and placed in a very hot oven. The wooden packet arrives at the table edges charred and still glowing embers, and it encloses an exquisitely flavored fillet imbued with the unfamiliar smokiness of the kigu and the musky essence of the mushroom. 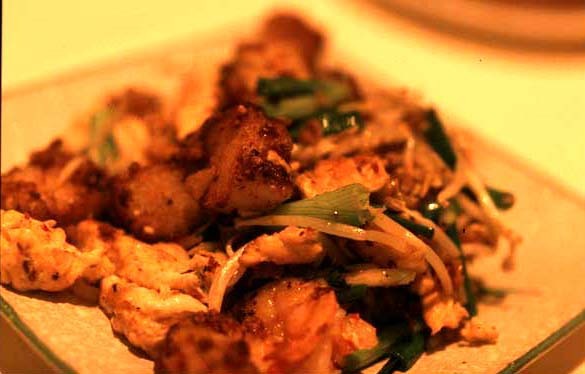 The fish's texture is indescribable -- firm yet gelatinous, charred yet moist. Part of 6-course set lunch menu that included other masterpieces such as tuna belly marinated in soy and truffle oil and a soft-shell crab salad served with a chilled but still-runny poached egg. My biggest regret about this trip? That we didn't have an opportunity to revisit Yoshii for dinner. Dave and I disagree on this one. I vote for Manta in Woolloomooloo. It's a matter of technique; Manta serves theirs with the muscle uncut, so eating the Pacifics or Sydney rocks requires a couple twists of the fork tines, which can be a bit laborious. 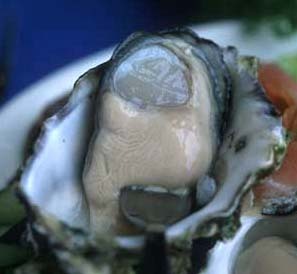 But made worthwhile, I think, by the unwasted oyster liquor that can be slurped from the shell after the bivalve has been ingested. and griddle-BBQ'd fillets (barramundi, below, for Dave and John Dory for I). I've been cooking fish for many, many years, and I've yet to figure out how to turn out a fillet as beautifully done as this one. Cooked through yet supremely moist and tender. There's a Doyle's at Circular Quay now, but if you've a few days in Sydney it'd be a shame to give the original a miss. The ferry ride is pleasant and there are some nice walks in the vicinity. The old building is a gem, many of the waiters are vintage -- go on a weekday when it's quiet, grab a window table upstairs, enjoy the view and some very fine eats. Actually, our only disappointment in Australia, so perhaps I shouldn't complain. But Icebergs at Bondi Beach is so vaunted, so lauded, so praised in the press (not just the Australian press -- it received very favorable mention recently in both the New York Times and the LA Times) that I will allow myself to be the lone dissenting voice. Food? Good, I think. Service? 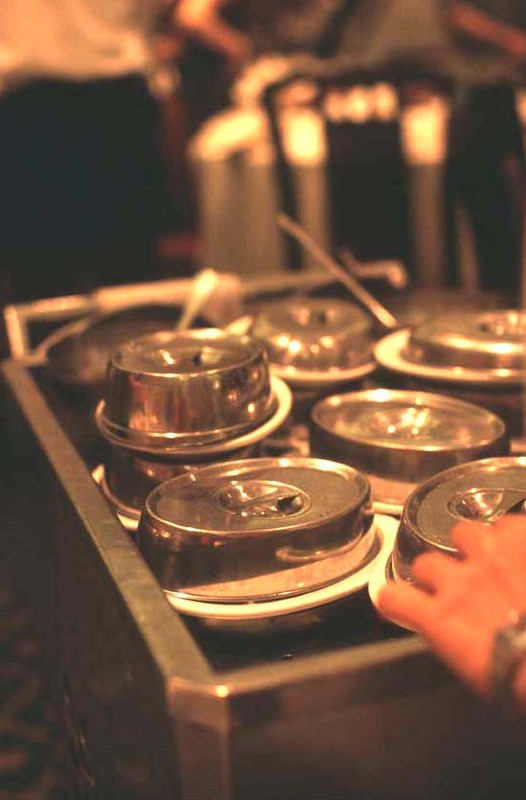 I've had better service in a state-owned restaurant in early-reform era Communist China. For me, the two are intertwined, and the finest grub in the world served in the most exquisite surroundings isn't worth a ringgit if it isn't accompanied by something other than complete incompetence, which is what Icebergs dished up for us from start to finish of our three-hour ordeal (that's only up to and including entree -- we literally fled the place before dessert and coffee). I'm talking 30 minutes to get a drink in the bar, where we waited for our table. I'm talking finally getting the drink -- just one, not both -- and then waiting another twenty minutes to get the other. I'm talking a frosty waitress (it's not named Icebergs for nothing, apparently) who repeated her polished disappearing act whenever we had a course coming up. I blame whatever else it was -- besides adreneline -- that was coursing through her veins (I was tipped off by her bizarre fidgeting and the fact that she kicked me under the table five times while reciting the evening's specials ...without noticing). I'm talking a starter that arrived before wine, water, or any other beverage did (and was finished before we could flag someone -- anyone -- down to remedy the problem); a rocket salad that spent so long waiting to be picked up (AWOL waitress again) that the leaves were limp, soaked through with dressing by the time it arrived at the table; and I'm talking entrees that had to be inquired after twice -- waitress responded to our first inquiry with this witty reparte: "But this is only the first time you've asked about it!" -- before they finally made it to the table 45 minutes after appetizers were picked up. I guess we should have been tipped off when we called that morning to confirm our reservation (made by email two weeks earlier; email acknowledgment by Icebergs in hand when call was placed) and were told it didn't exist. So, Icebergs -- wasted evening, wasted money, and --- what pisses me off the most --- with only 6 dinners to be had in Sydney, a precious one wasted. Let's not end this on a negative note. On our first night in Sydney -- the night of the Melbourne Cup, the race that stops a nation (and, apparently, gives it a legitimate excuse to get tanked) -- we sought one thing that's hard to come by here in KL: a top-quality, wood-fired oven baked pizza. Our concierge sent us to Arthur's, and for this alone I plan to write a letter of thanks to our hotel. Arthur's is a joint, not a fancy-schmancy pizza "bar" or "cafe". It's long and narrow; at the front, prep counter and ovens on one side and tables on the other, with more tables in the back. The door is manned by a couple of old Italian gents -- a good sign. Pizzas come in three sizes (facilitating sampling), and there's nothing weird like Thai curry pizza or some such on the menu. Pizzas are thin-crusted, brown and blistered from the fire, topped with quality ingredients. Surprisingly, for a pizza joint, salads are delicious -- for example, a rocket salad made with fresh, crisp greens mounded on a plate, simply and lightly dressed with good olive oil and topped with shavings of aged parmesan reggiano. Arthur's is BYO. Conveniently, there's a bar and bottle shop a couple doors away. And service -- provided entirely by young Japanese waitresses, not sure what's up with that -- is friendly and quick. Icebergs management might consider taking a lesson from this place. If the weather cooperates, which it did for us. After our fair share of rain during the trip (not complaining; the nice thing about rain is it doesn't prevent you from eating) we were blessed with a final day that was not too hot, not too cool, sunny but for the occasional shadow created by a whispy puff of a cloud. So how to pass such a glorious day? 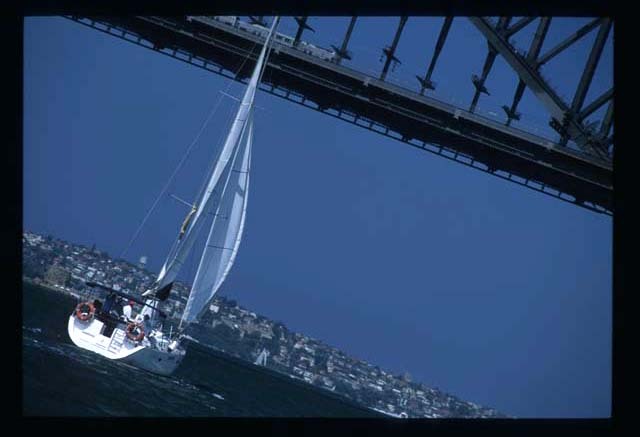 Ferry out to one of the 'burbs, rustle up a picnic lunch (easy to do when every little town in the area seems to have a gourmet deli and a lovely produce market) and while away the afternoon eating, napping, and just generally relaxing under that deep blue Australian sky. 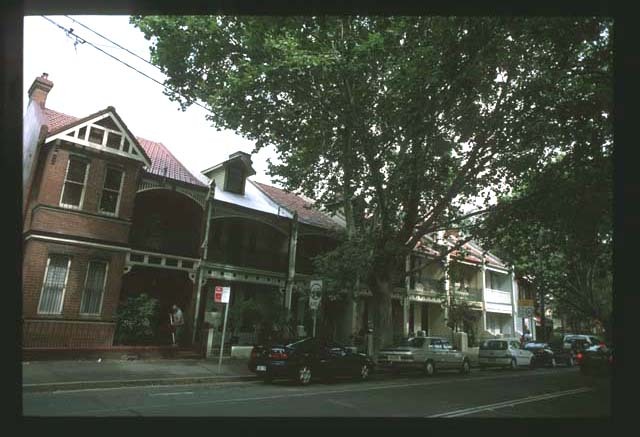 Sean's Panorama, 270 Campbell Parade, Bondi Beach. Tel. 9365-4924. 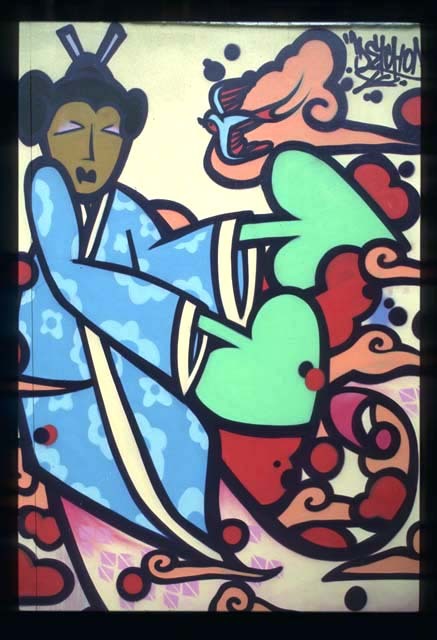 Yoshii, 115 Harrington St. Tel. 9274-2566. Manta, The Wharf, Cowper Wharf Road, Woolloomooloo. Tel 9332-3822. Doyle's Watson's Bay. At Watson's Bay! The older building on the beach, not the one right next to the pier. Arthur's, Oxford Street steps from the Ormand St. intersection. Open till 11-12pm. There are times when I'm more aware than others that I'm living quite far away from where I grew up. These hairy, psychedelic orbs (yellow rambutans) began sprouting on a tree behind our house a month or so ago. A great number of them -- wholly grass-green and the size of a large marble to begin with -- were devoured by a not-very-small lizard that crawled daily to the very tips of the tree's branches in search of a snack. Those that survived lizard lust (quite a lot, in fact) are now the desire of monkeys, which descend on the tree in chattering groups of 4 or 5, shaking the branches to dislodge the fruits and then leaping to the patio below to gather their harvest. 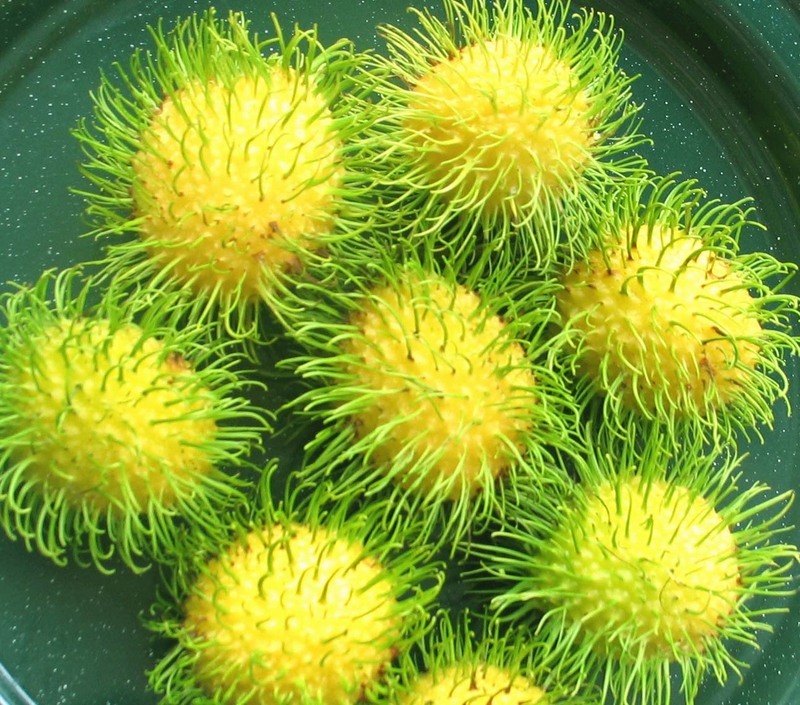 Unlike this blogger in Azerbaijan (one of my favorite blogs, by the way, even though it's nothing to do with food) I have nothing at all against monkeys, and every time they show up for a rambutan feast I can't help but think of naughty, adorable Curious George. But monkeys are not cuddly creatures. In fact they can be quite nasty, as was demonstrated when an acquaintance's dog was attacked by a group of them and ended up in vet clinic for two weeks. When the monkeys make an appearance, we bring the cats in. As for the fruits themselves, while they're lovely to look at they're not much to eat. They're sweet, but not very juicy, and the skin of the seeds sticks to the flesh. I may have a bounty of yellow rambutans in my backyard, but I'm sticking to the store-bought red variety. What could I possibly have to say about Sydney that hasn't already been said? I'd heard that it's a beautiful city blessed with a spectacular setting. It is. 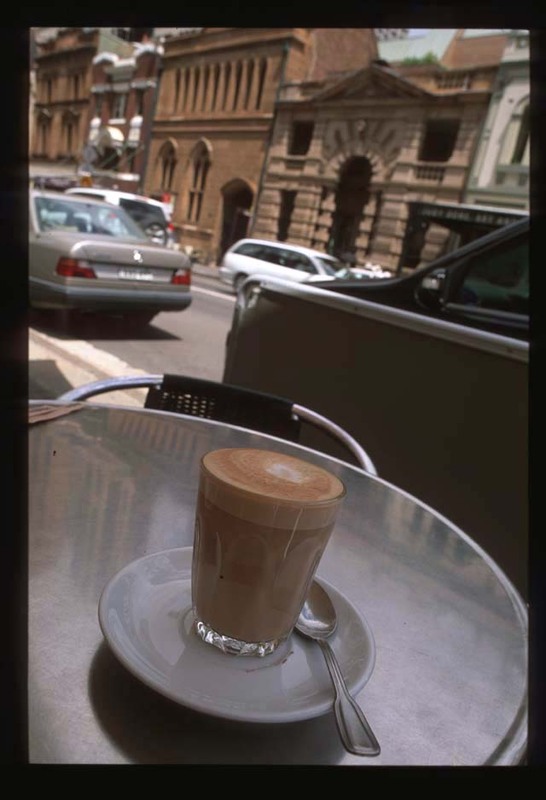 I'd heard that it's nearly impossible to get a bad cup of coffee in Sydney. From our admittedly limited experience, this seems to be the case. Generations of Italian immigrants seem to have insured that every latte will be topped with a perfect, soft froth of milk and every cappucino with the ultimate crema -- in contrast to the sorry, airhole-pocked foam that too often bobs atop these beverages in the U.S. I'd heard the locals are laid-back and friendly and they do seem to be. 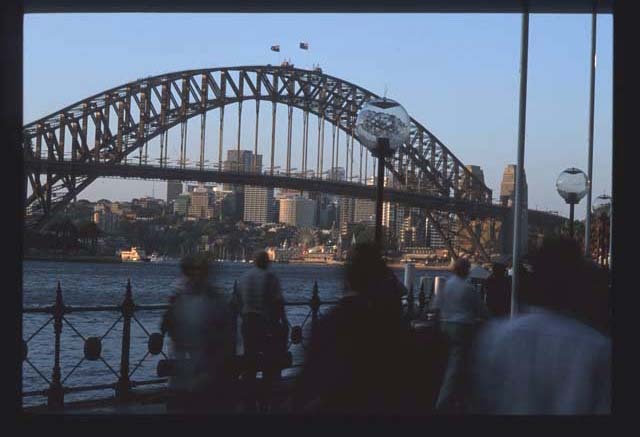 In fact, I was waited on and helped by a number of teenagers while in Sydney; strangely enough not one snarled, smirked, or otherwise copped an attitude. Instead, they -- and every Sydneysider (Sydney-ite?) we came in to contact with -- were convivial to the max. I've heard that Australians bemoan customer service standards in their country. I say, just try ordering a foam-topped cappucino at some arty-farty coffee shop, or attempt to flag down any help in the average clothing store, inthe U.S., and you'll really know what sullen service is. And when it comes to food ... well, on second thought, I do have a bit to share about Sydney. Too much, in fact, for one post. Before getting to the meat of the matter (Bests, Worsts, Absolutely the Most Nightmarish Restaurant Experience in My Life EVER -- ANYWHERE, Must-Eats ... stuff like that) in my next post, I'll open with a fantastic lunch in a groovy little restaurant/cafe in what seems to be an up-and-coming good food 'hood, that happens to have some fine graffiti gracing its alleys. I'm referring to a small patch of Surry Hills a bit further south, where Devonshire meets Bourke (and a few blocks up and down and to the east). Quiet, tree-lined streets lined with vintage semi-d's adorned with wrought-iron gingerbread. A few quirky boutiques, small eateries turning out tasty nibbles, a youngish population, lots of dog lovers (a positive in my book). 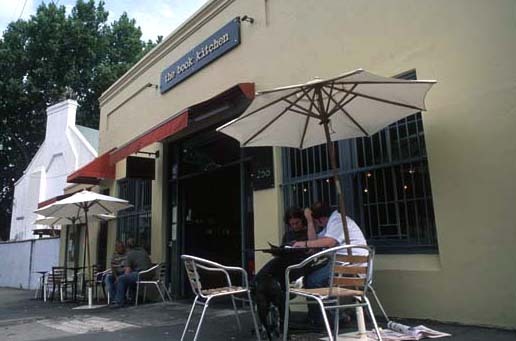 As it's name suggests, Book Kitchen is both a cafe and a bookstore. 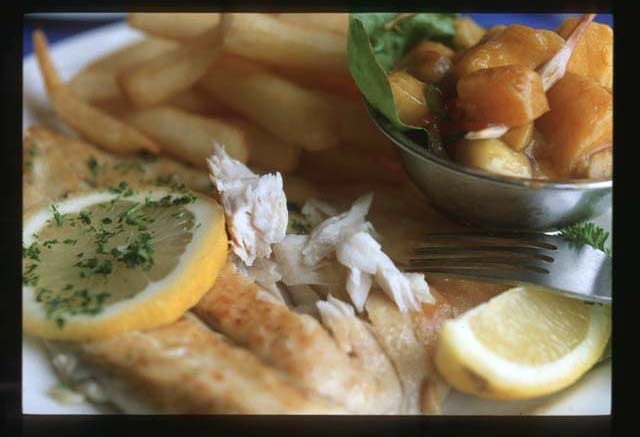 The selection of books is limited to cookery and other food-related books, primarily by Australian authors. 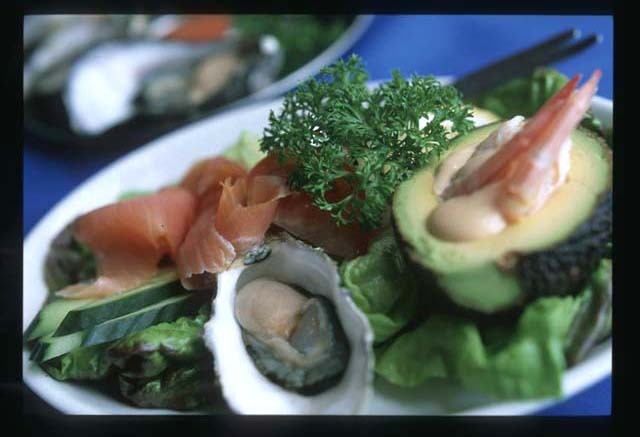 The selection of dishes is limited to delicious stuff. Ambiance is casual, service is friendly (and indulgent -- our waitress didn't blink an eye when we changed our order three times -- perhaps she suspected we were visitors the clock running and too much Sydney fare yet untried), fare is simple but crafted with the frehest, best ingredients. This is a breakfast and lunch place, and the entire menu is available all day long. Which means you can have eggs at two in the afternoon, if that's what floats your boat. It did ours. Behold my Spanish baked eggs. 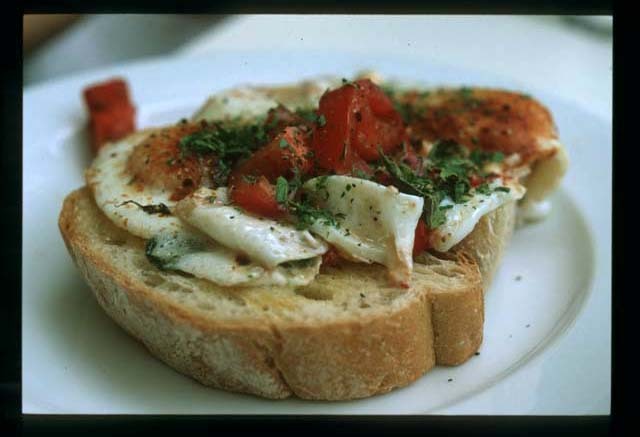 Not sure the photo does it justice; what we have here are two eggs done just right (yolks still plenty runny but none of that mucous-y goo that is the hallmark of an underdone white), slices of freshly-roasted red capsicum with bits of char still intact, shower of chopped Italian parsley and hand-torn fresh oregano leaves, a sprinkle of jazzy Spanish smoked paprika, on thick slice of lightly toasted dense and chewy, not-too-tangy sourdough. The lot drizzled, not doused, with good-quality, peppery olive oil. 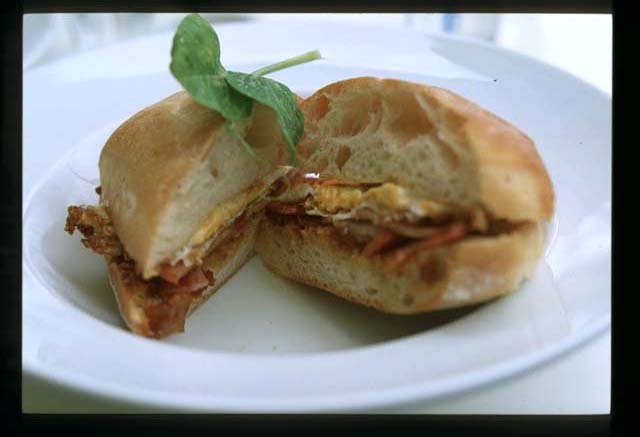 Easy dish, but deceptively hard for a cafe (or me, for that matter) to do well. I didn't actually taste this porky, eggy bun-full (Dave wouldn't share ... maybe because I wouldn't), but from an arm's length away I got a clear schnoz-full of salted, smoked, bacon-y perfume that made me salivate like you-know-who's dog (this even as I was devouring my eggs). Dave pronounced this sam worthy of any rabid sandwich connoisseur's (he's part of that club) devotion, and I believe him. 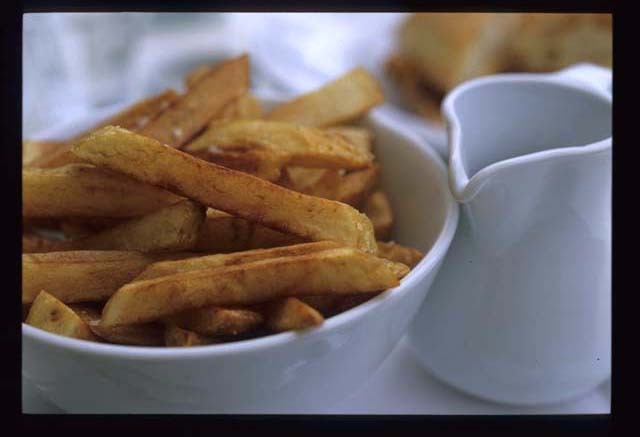 And since we're carbo-loaders (just big eaters, actually), a side of chips, with malt vinegar and a saucer of crunchy sea salt (a wee bit precious perhaps, but in my book half of the appeal of chips is the salt they're sprinkled with, so why not make it a good one?). Really more oven fries than properly, deep-fried chips (I imagine more than a few chips lovers are sneering at this very moment), these spud sticks were nonetheless golden and roast-y tasting and not at all limp, lovely dippers for the vinegar. I grew up eating ketchup (Heinz only) with my fries, but I am beginning to understand the attraction of accompanying them with a sour liquid instead. We weren't sated after lunch -- well, that's not true, we were extremely, close-to-bursting sated, but when has that ever stopped me from pursuing gastronomic temptation when it looks me square in the eye? So we stepped just across the street into a tiny breast pocket of a bakery right on the corner of Devonshire and Bourke. This primarily take-out shop, which nonetheless serves coffee and sandwiches at one small window table and one outdoor table as well, was really doing the biz (the cash register jockey sent more than a few disappointed souls out the door with the news that the spelt bread had sold out) and no wonder; the aromas wafting out from the kitchen and hovering around the display case were intoxicating. Too much to tempt (including a luscious looking foccacia with black olives, oven-dried tomatoes and fresh rosemary) and, alas, not nearly enough empty space in my stomach. 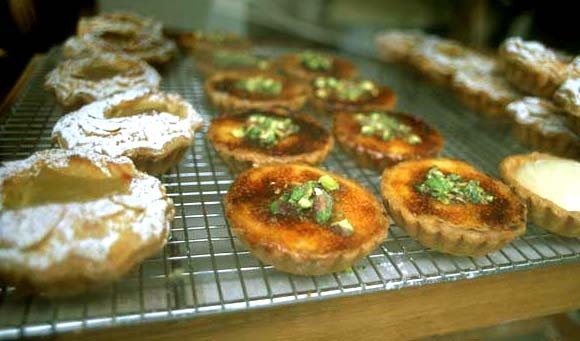 I settled on a single ginger brulee tart topped with chopped pistachios (middle above). Creme brulee is a dessert that many restaurants attempt and few get right, and here it was in a substantial yet flaky pastry shell, heavily flavored with peppery ginger that did a nice job of cutting right through the rich, rich, rich custard, with a crisp, caramelized surface. Should have gotten 500 to go. Can't recommend this yummy little corner of scrumptious Sydney highly enough. We discovered, as we were leaving Book Kitchen, that it's now open for dinner Thurs-Sat. I'm still carrying the xeroxed menu in my wallet (why? the only answer I come up with is that I'm a masochist). How I wish we'd had an extra evening to return for dishes like: ricotta dumplings with sage butter and bosco pear, tomato tart with tomato crisps and roast garlic fritters, fricassee of Barossa Valley rabbit with sauteed potato and fresh horseradish, roast spring lamb rump with blue cheese pithivier and eggplant salad ..... you get the picture. 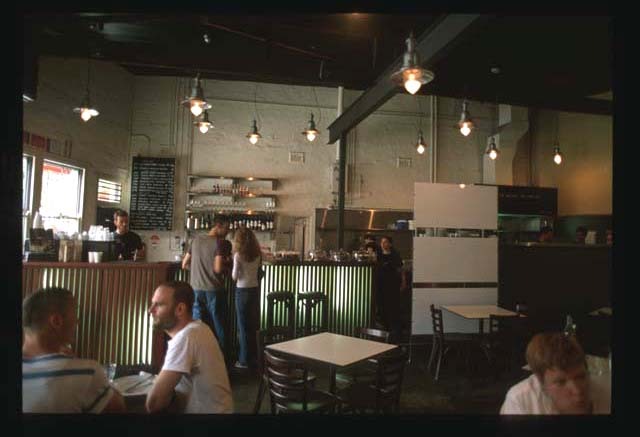 Book Kitchen, 255 Devonshire Street, Surry Hills, tel. 9310-1003. No-name bakery ('cause I didn't get the name, not because it doesn't have one), right at the corner of Devonshire and Bourke Streets. If you've ever eaten dou miao in a Chinese restaurant they've probably been stir-fried with garlic and perhaps a drop or two of oyster sauce. 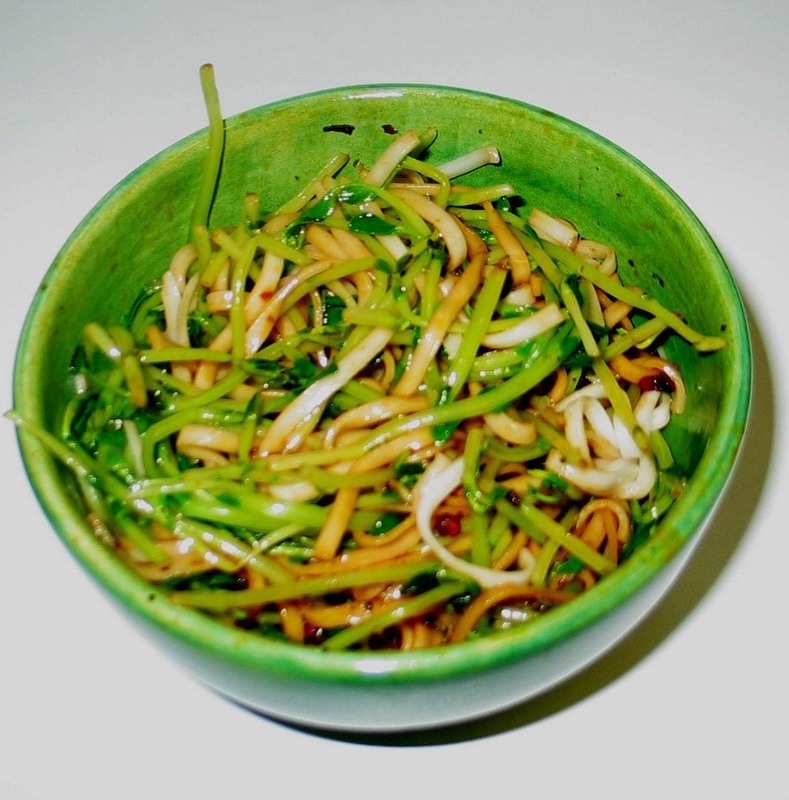 But these little shoots are also delicious raw, tossed with an Asian-style dressing (1 Tbsp each of soy sauce, sugar, rice vinegar mixed with 1 tsp sesame oil, black pepper, and shredded ginger), or lightly steamed and simply dressed with sesame oil and salt. Or, chop them roughly and add at the last minute to a pasta with prawns, fava beans or peas, and a dash of white wine. 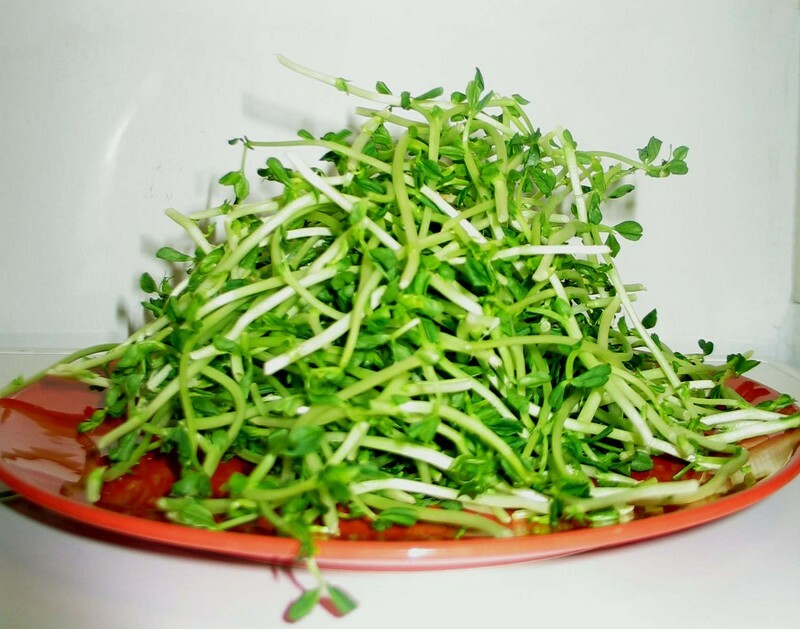 I first tasted pea shoots and greens years ago in Chengdu, where they usually appeared in spicy noodle dishes, blanched quickly in the same water used to boil the noodles. The attraction of that unlikely combo has stuck with me; something about the duo of almost-fresh greens and bland, slippery noodless facing off against an assertive, chili-based sauce just seems so right on the tongue. Pea shoots (but not greens, alas) are sold here in KL at supermarkets and wet markets; an 8-ounce bag costs about 3 ringit (less than a dollar), and the contents are always springy with life (pea shoots sold in the States are often too far into their 3-day good-eating lifespan). I pined for them in Saigon -- there really is no substitute when you're jonesing for their flavor and texture -- so I've been taking advantage of their ready availability here, especially at lunchtime. My favorite way with them is a simple, light (no meat), and spicy noodle dish that comes together in just a few minutes longer than it takes to boil a pan of water. This noodle needs a good-quality la jiao (chili flakes in oil) -- it's the backbone of the sauce and a lively-flavored one makes all the difference. I've been pretty much in love with this la jiao ever since we lived in Shanghai; our ayi's daughter, a stewardress with Shanghai Airlines, used to cart jars of the stuff home for us whenever she worked the Shanghai-Guiyang (Guilin province) route. We took 6 jars with us when we moved back to the States, but it soon appeared on San Francisco Bay Area shelves. Our current (and nearly depleted) jar was sourced in Saigon in a provisions shop on Ham Nghi Street a few months ago. 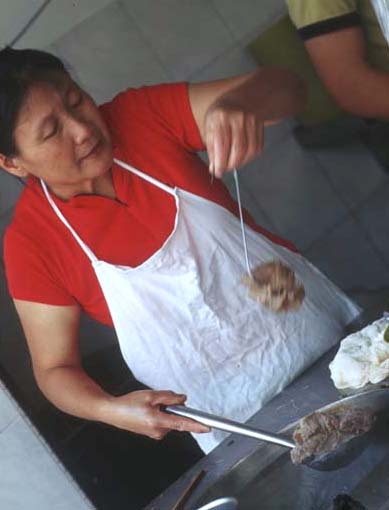 Lau Gan Ma (the brand name) seems to have become a worldwide phenomenon in the last 10 years. Combine 1/2 cup dried red chili flakes (use any kind of chili you like -- if you have a low tolerance for heat, seeded New Mexico chilies will give a pleasant roasted flavor, without the burn), 3 Tbsp chopped Chinese black beans, 1/2 to 1 heaped Tbsp. szechwan peppercorns (optional), a couple or a few peeled and smashed garlic cloves, 1 cup peanut oil, and 1/4 cup roasted sesame oil in a pan. Heat on top of the stove to about 250 degrees on a deep-fry thermometer and then simmer for 15 minutes. Stored in the fridge (bring to room temperature before using), this oil will keep nearly forever. This is a dry noodle (no soup). The recipe is geared to tinkering; consider the proportions a starting point. I like my noodles very spicy and assertively sour from vinegar -- feel free to adjust to your taste (for that matter, use rice vinegar if you find the taste of Chinkiang vinegar too strong). Also note that water clinging to noodles and shoots will dilute the sauce a fair amount; keep that in mind as you are mixing and tasting. 1. Pick through the pea shoots and remove any brown or black pieces. Wash and drain (don't need to spin dry). Bring a pot of salted water large enough to hold the noodles and shoots to the boil. 2. Be sure to note how long the noodles need to boil for -- drop them into the boiling water and keep track of their doneness (with a watch or by taste-testing). 3. Cut the garlic clove in half and rub the sides and bottom of the bowl the noodles will be served in(or eaten from) with it. Discard the garlic. Mix soy, sugar, la jiao, vinegar, and ginger in the bowl with a fork or whisk till sugar is dissolved. Taste and adjust for sourness, spiciness, saltiness. The sauce should be very strong -- it will be diluted once noodles and greens are added. 4. About 2 minutes before the noodles are done, add the pea shoots to the water, and stir to make sure all spend some time submerged. What you're looking for is a shoot that's more boiled than blanched, but not completely limp. 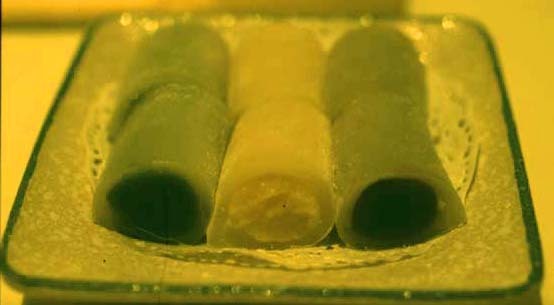 The shoots should retain a tiny bit of crunch. 5. Drain noodles and pea shoots into a colander and immediately add to the sauce. Toss and enjoy. Kinda nice with a flurry of chopped coriander on top. Putt putt putt .... I'm starting to feel like a decrepit hunk of junk of a car grinding its way down the road. One hundred is on the horizon. With your help I'll get there this weekend and a wee package of Malaysian treats will be on its way to someone, somewhere, next week. One thoughtful reader emailed to say it wasn't that he didn't want the goodies, it was that he didn't want me fork out the cash for postage. It's OK! I spend that much every couple of months getting my favorite coffee shipped over from California. Hey -- I've offered to give you a taste of Malaysia, so let me put my money where your mouth is. I thoroughly believe that an essential ingredient of good food -- any good food -- is love. Love of eating, love of ingredients, love of the act of cooking itself, the cook's love of the dish he or she is creating, or for whomever he or she is preparing it for ... indifference simply does not translate well in the kitchen. If my theory holds true, then what we have above is one big pot o' love. 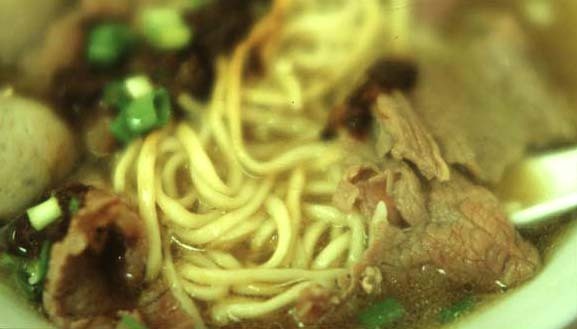 It's beef, cooked long and low with a secret mix of seasonings (I suspect star anise is included), and it figures prominently in the simple noodles turned out at a mere sliver of a shop on Jalan Tun Tau Cheng Lock. Shin Kee claims to be a "Beef Noodles Specialist" (just barely visible on the right side of the sign). To me, when it comes to food, specialization implies not only a limited menu but also a markedly high level of skill developed over time, with practice. After tasting the product I believe this lady has earned the right to claim the "specialist" title. Shin Kee's menu is short and sweet: fresh beef noodles (xian niurou mian), beef ball noodles (niurou wan mian), and beef mix noodles (niu zarou mian). A small bowl for 4 ringit, a big bowl for 5. We avoided the latter (I hadn't yet had my innard epiphany) and ordered the first, with yellow mee noodles (guaytiaow and mi xin rice noodles are other possibilities). and meat balls are added before the entirety is anointed with broth, a spoonful from that beefy pot o' love, sliced scallion, and a bit of chili sauce. 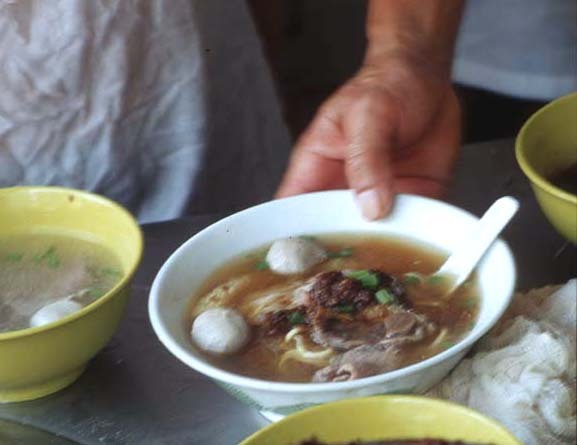 The broth is dense with miniscule meat shreds and the balls evince a good texture -- bouncy but not so rubbery as to be teeth-repellant. And they really, really taste like beef. The sliced beef, reminiscent of what you might get in a bowl of Vietnamese pho bo tai, is not overcooked, though I think that next time I'd ask for it served a smidge redder. 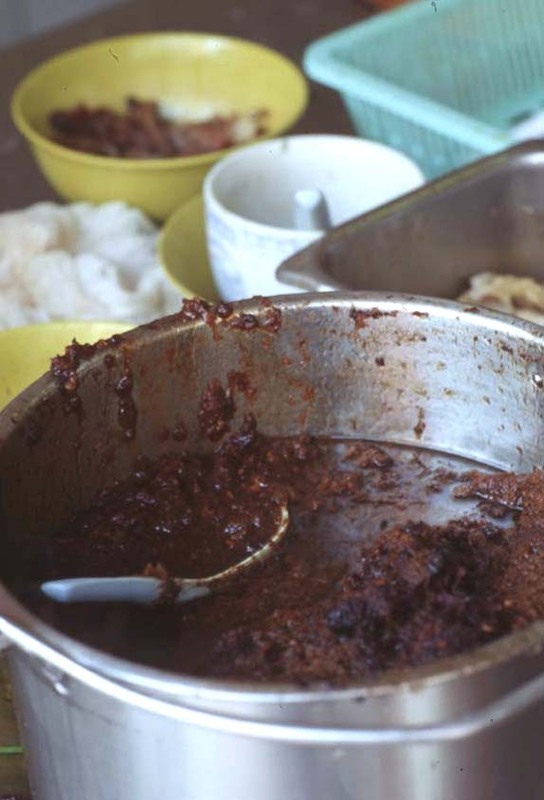 The goo from the pot and the chili paste are what really make this a bowl of rich and spicy, greasy meaty goodness. After sucking up solids and slurping a fair amount of broth we're left with a chocolate-brown liquid at the bottom of the bowl. While slurping and sucking we noticed that the folks at the neighboring table -- at most of the neighboring tables, in fact -- were taking their noodles dry, with nary a ball nor a slice but plenty of nubbins from the pot o'. 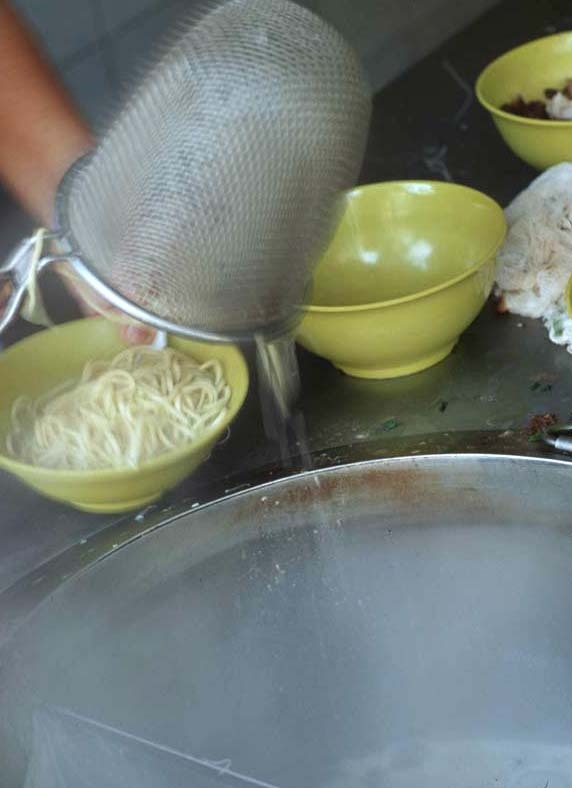 This obviously required investigation, so I waddled my way back to the prep station at the front of the shop and asked for -- with sign language -- a bowl of guaytiaow noodles dry, topped with nothing but love from the pot. It was worth stuffing down lunch number two to discover this mound of of lusciousness that I will return to Shin Kee again -- and again and again -- for. 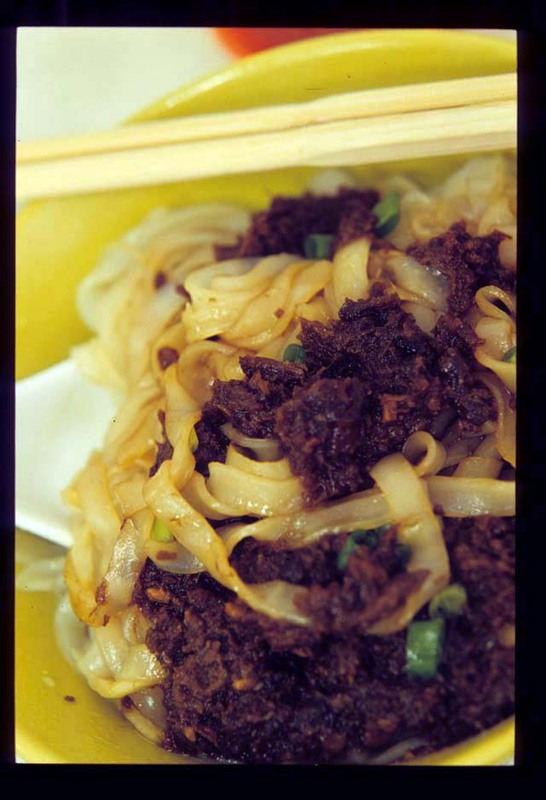 Two fingers of broth at the bottom of the noodle bowl, along with an additional bowl of it on the side, facilitate a thorough mix of ingredients: pot stuff, chili paste, and soft, chewy rice noodles that seem to absorb the very essence of the meat mince. While Shin Kee's beef slices and balls are tasty, the mix in the pot is really the masterpiece in this gallery, so why not put it up front and center? 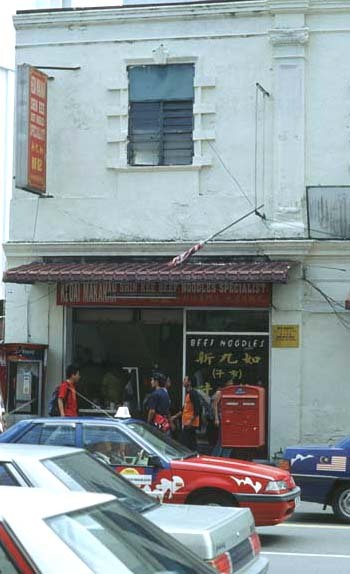 Shin Kee Beef Noodles Specialist, on Jalan Tun Tau Cheng Lock, about a half block from the entrance to Petaling Street and across from the Rubber Trade Association of Selangor building (look for the red sign). Open 10:30am to 3:30pm.